They came out a much better team in Saturday night’s rematch. 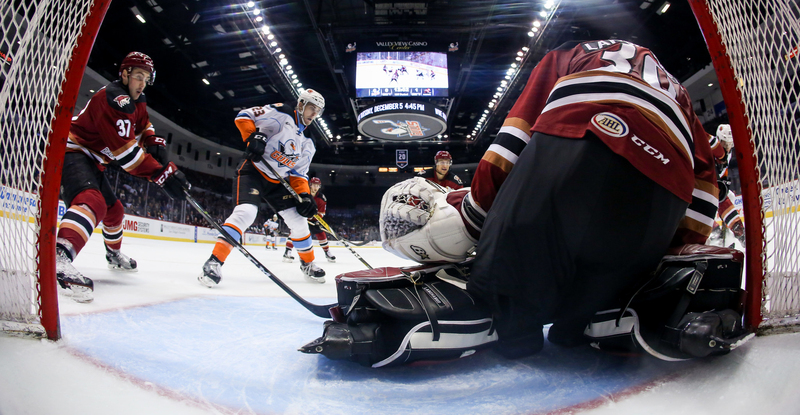 Cashing in late secured a standings point for the Roadrunners, but they were unable finish the deed following regulation, falling 3-2 to the San Diego Gulls in a shootout at the Valley View Casino Center. Marek Langhamer, getting his first start since October 27, put forth a phenomenal 34-save effort to keep the Roadrunners in the thick of Saturday’s affair. Langhamer was given an early source of support when Lawson Crouse tipped home his third goal of the season on the team’s first power play of the evening. Crouse, driving to the net while Kyle Capobianco corralled the puck and wristed a shot into traffic, beat San Diego’s Kevin Boyle with a deflection to give the Roadrunners a 1-0 lead just over six minutes into the game. Crouse’s goal was his third in as many games. For Capobianco, his assist extended his point streak to three games. Neither team would score again until the third period. Langhamer remained solid, turning away San Diego’s 17-shot flurry in the middle frame, and the Roadrunners played disciplined, not taking a penalty until the final minutes of the second, keeping the Gulls’ league-best power play unit off of the ice. With just over 13 minutes left to play in regulation, an Andy Welinski shot found its way through traffic and past Langhamer to tie the game 1-1. 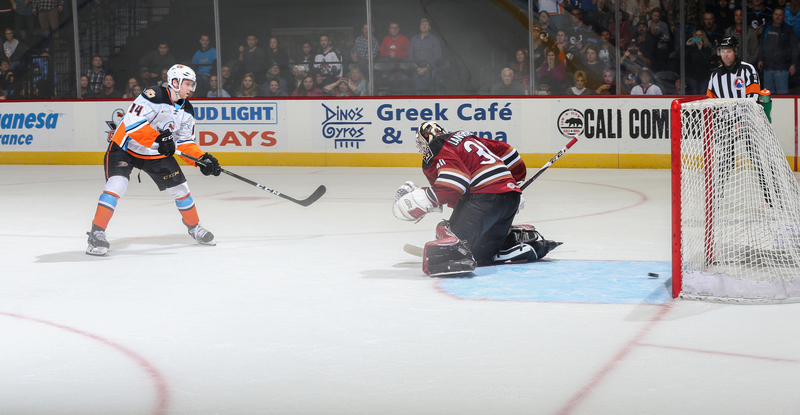 Less than four minutes later, Spencer Abbott gave the Gulls their first lead of the night. Down 2-1, and with Langhamer pulled for an extra attacker, Lane Pederson rifled a one-timer past San Diego’s Boyle to tie the game 2-2 with 1:34 left to play. For Pederson, it was his third goal in as many games, and his fifth consecutive game with a point. Overtime would produce no result; Dylan Strome was turned away of the extra frame’s best opportunity early on. The Roadrunners outshot the Gulls 5-3. In the shootout, the first of the season for the Roadrunners, the Gulls outscored the Roadrunners 2-1, Tucson’s only goal coming from Mike Sislo in the third round. San Diego scored in both the second and third rounds. With two assists Saturday night, Kyle Capobianco (1G, 9A) is now third on the team in scoring with 10 points. Marek Langhamer stopped 34 of the 36 shots he faced. The Roadrunners now return home to begin a five-game home stand Wednesday night when they’ll host the same San Diego Gulls at Tucson Arena, where the puck is scheduled to drop just after 7:05 PM.